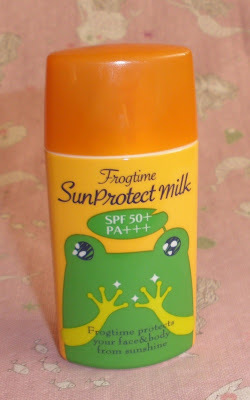 Someone asked me to write about the sunscreen I am using this summer so I will review the Frogtime Sun Protect Milk SPF50+ PA+++ from Naris Up. Frogtime seems to be a mini skincare series from Naris Up and I purchased 2 products, the other one being the hand cream (great stuff, should review soon, too). 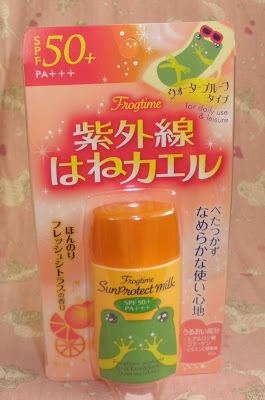 The Frogtime Sun Protect Milk comes in a cute and cheery orange bottle with a cute frog character printed on the front. 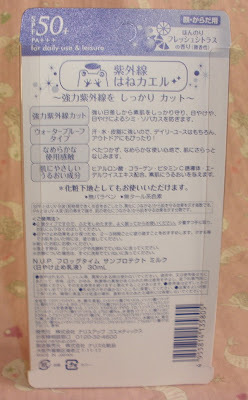 This is a strong sunscreen offering a protection of SPF 50+ and PA+++ for "daily use and leisure" hehe. I am not sure if this product is supposed to be scented with orange (as there are oranges printed on) but to me it´s absolutely odorless. 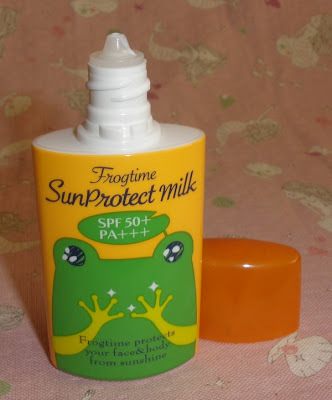 This is a lightweight quite liquid milk which absorbs really quickly and leaves soft but in no way greasy skin so it´s a really comfortable sun protection milk to use on the face (and/or body but the small bottle will be empty quickly). 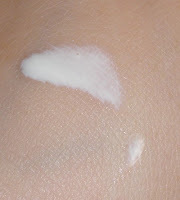 The 30ml should be shaken prior to each use and I don´t know the retail price as it doesn´t seem to be printed on the package but I purchased it for less than US$10 from ebay seller alphabeautyuk.